Modern Kitchen Cabinets Orlando – contact top design center Orlando offers. Professional design and quality. You may be tempted to buy all of those power tools and all of that equipment and fancy yourself to be an adept handyman. But why go through all the trouble when you can just sit back and relax while the pros do it? 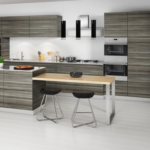 Professional designers will draw your contemporary kitchen layout with your preferences and movement habits in mind, and you will also be given design proofs before the final work is carried out.